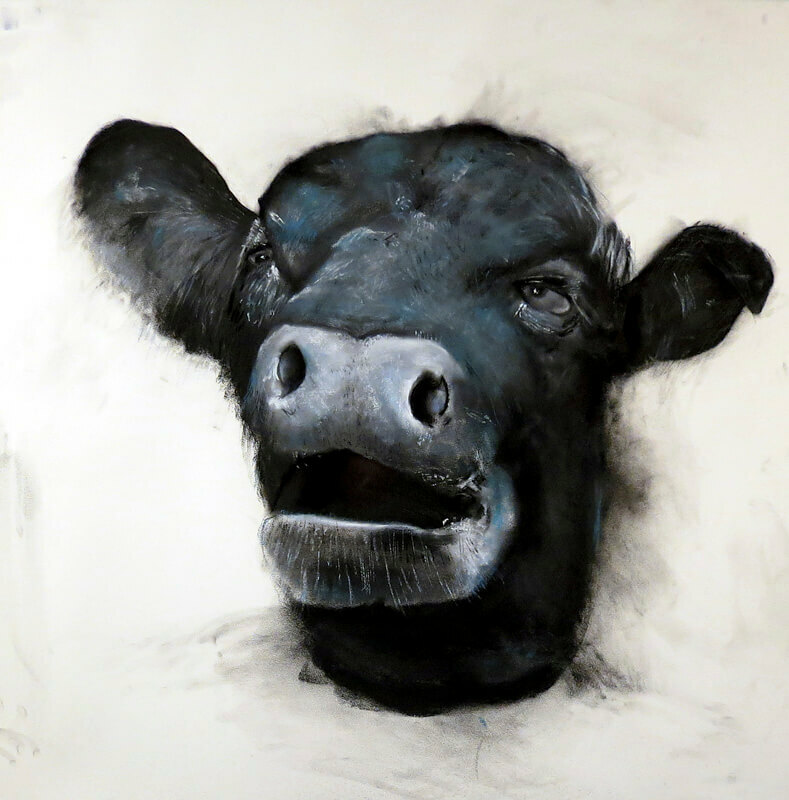 Joe Broghammer’s new October exhibit, Herd, at Anderson-O’Brien Gallery is all about barnyard animals. While Broghammer states that the show is about a conversation with himself in his studio, it would seem that the animals presented have been given something they want to say directly to the viewer. They have so much individual personality that each seems to have taken over its own story and is speaking directly to us—some seeming self-absorbed, some grumpy or aloof, others pensive or even happy (as we see in the large-toothed “Gus, the Goat”). Because of the large size and portraiture-like approach of most of the images and their rather plated presentation, the viewer has the tendency to interpret each beast as being as contemplative as their creator. When given time to study, each seems to suggest by its expression an individual philosophy of life. In looking at “Katie”, the lovely beast shown here, one might interpret her open-mouthed expression as awe. And the softness of black, along with the light of white with bright blue passages and gray-green, off-set eyes make Katie a one-of-a-kind personality. One tends to want to guess what’s on her mind. This is the work of an accomplished expressionist artist. The smooshed and lovely, often innovative use of colors in each animal calls us to carefully regard the details in order to assure that we catch their nuanced richness. And the random charcoal hand marks and smudges made in the development of the drawing in each composition seem crucial for the inclusion of texture in order to attain a sense of gestalt, or completeness in each artwork. Broghammer says he first started with dead animals. For example, the massive pig head on a wooden table, “Sue, Dressed for Dinner”, and “Suka”, a full side-view cow which has a porthole in one of its four stomachs to facilitate the vet’s (or farmer’s) ability to empty it out when needed. The artist sees this as an invasion of the cow’s privacy, as we might, also. This artist tends to work in themes. Early on in his career, he would use objects to start the compositions, and then add shapes to arrive at an abstract/surreal approach. Later, he began designing on the frames to add pizazz to the images within. But the frames began to take over the artwork itself, as well as move too much into folk art than remain in contemporary art. So he discontinued with that style. He then stayed more than 10 years with a bird theme (which is not done yet—“Little Prick”, a feisty rooster is in this show, along with a seemingly arrogant chicken called “Limpia”). It was during a month-long residency at Puerto Vallarta that this new theme began to emerge, partly as a result of what seemed to be a midlife crisis. Broghammer felt a need to change his approach—which, after some experimentation became the quieter, more contemplative work we see in this exhibit. Broghammer has always chosen to live in the same space as he creates his artwork, so he can immerse himself in the process of developing each artwork. He works in the basement so he can work when he chooses, not worrying about when or how long he stays with it. And he does one piece at a time, until it’s finally finished. If something doesn’t seem to accomplish what he planned, he doesn’t keep it, but gets rid of it and starts anew. This show did turn out to push the size of his workplace, though. “Helen”, one of the three oil paintings, is 7 feet tall–almost as tall as the ceiling, so it was quite a challenge to paint in the basement studio. Broghammer says he feels proudest of his large pig “Ralph”, an oil painting in soft pastel colors, which has quite large and wing-shaped ears, a very protruding and round gold-colored nose and tiny eyes. This majestically-sized character is certainly commanding in its space. Perhaps it takes a crisis of doubt for serious artists to bring in this higher level of accomplishment. When we read about artists like Mark Rothko or Jackson Pollack or look back at Cezanne and Matisse, all of these artists fought mightily to arrive at a new way of expressing themselves. So congratulations are in order for Joseph Broghammer. He has raised the bar with this new work. After earning a B.F.A. from the University of South Dakota, Vermillion in 1986 and completing his graduate work at the University of Wisconsin at Madison in 1987, Broghammer returned to Omaha. He has exhibited in numerous group shows and solo exhibitions in the United States, Holland, Germany, Mexico and Italy. Herd will be at Anderson-O’Brien at 1108 Jackson St until November 2nd. 402-884-0911. WWW.AOBFINEART.COM.